Back a few month ago was the New York Abilities Expo. We had barely heard of it and it picked our interest as it claimed to offer a one-stop source for disability products and services. As we did not have anything planed that weekend, we decided to rent a car (it’s actually in New Jersey) to go check it out. We did not know exactly what to expect and we thought that, worst case scenario, we could figure out how to turn this road trip into a fun trip wight the kids. It turned out to be an awesome experience. We spent our full day there, instead of the originally expected few hours. We were still talking to vendors when they were dissembling their stands. We were still talking to other visitors when the security kicked us out of the center. We learnt so much about so many things. We connected so well with vendors and other visitors. Such a valuable and enjoyable experience! The highlight of the expo was certainly when Stellan tried an adaptive tricycle. He first got really scared when we put him on the tricycle. He did his cute sad face and started crying. 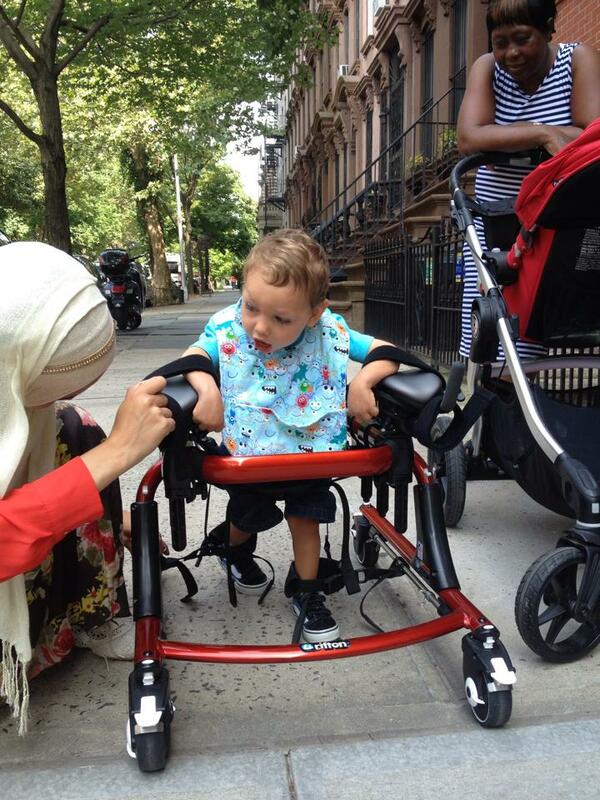 After a few comforting hugs, and after selecting a more adapted seating system, we put him back on the tricycle. As you can see on the video, he showed a positive response and started to like it. Great. I wish I had managed to capture the third trial because that one was the winning one. Once we adjusted a bit more the settings, we put him back on the tricycle. 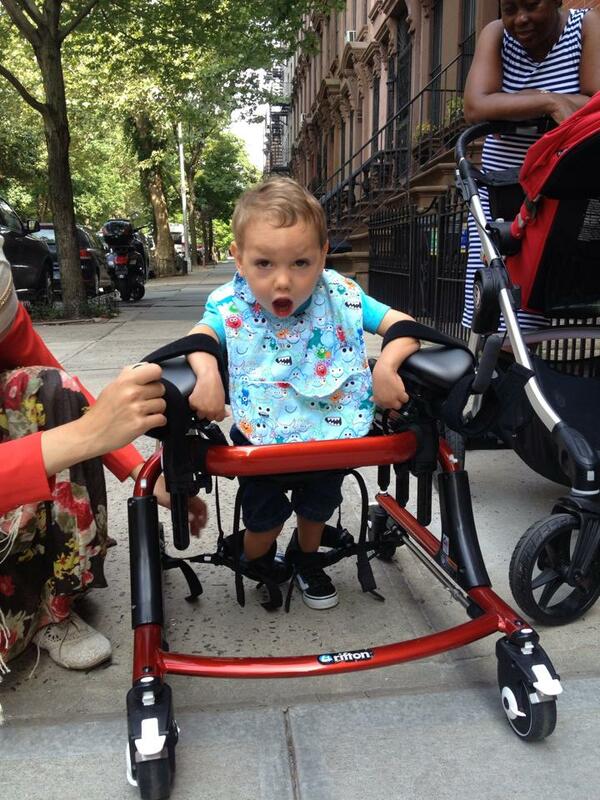 And that’s when the miracle happened: he started to pedal by himself while cracking up… No need to see more: the adaptive tricycle is next on our shopping list! So… this happened last week! We were gently playing with blocks like usual. I was helping Stellan to reach them and Zoe was throwing them on the floor, as it seems that this is what it makes sense to do when you are just 1 year old. Suddenly she stopped, she decided to step up and to take the lead. I was lucky enough to recognize that something special was happening. I managed to grab silently my iPhone and started recording the scene. I let them play and shed a tear while watching them. Zoe is just 1 year old and she is certainly one of the best occupational therapists out there! And who hugs and kisses his patient with so much love during a therapy session? 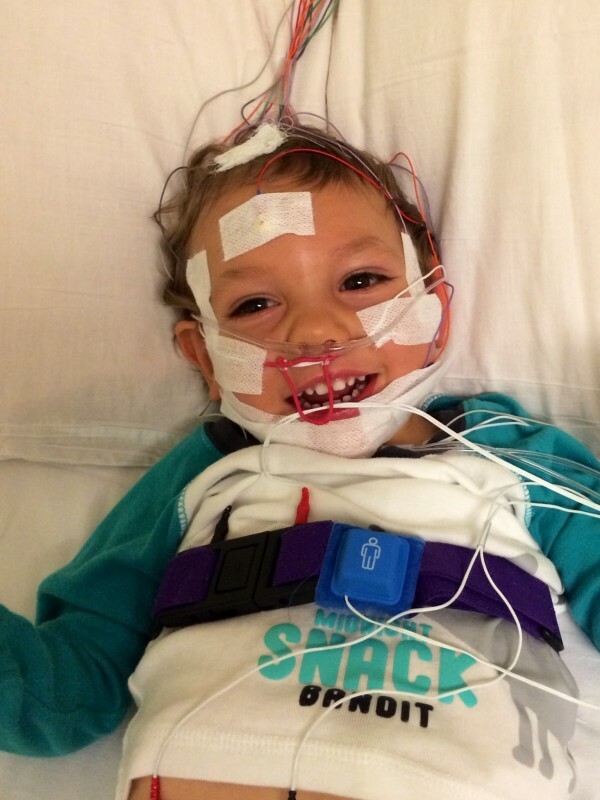 Last night, Stellan and Quentin spent the night at NYU hospital, where Stellan underwent a sleep study. It took a month to get the initial evaluation scheduled (or to even get someone to call me back, frankly), but once we had that last week, getting the study itself on the calendar was quick and easy. The sleep study was suggested by Stellan’s new ENT, the one who noticed his swollen tonsils and adenoids, because he wanted a baseline on Stellan’s sleeping (terrible) and breathing (not great either at the moment) to have something to compare to after he has his tonsils and adenoids out. It was the first major doctor’s appointment or medical event I didn’t attend, since I needed to stay home with Zoe, which felt really weird. It was so quiet last night without the boys. They were supposed to arrive at the hospital at 7:30 but I was a little later than planned getting home from work so they didn’t leave on time and ended up getting to the hospital around 8:30. By the time Stellan was all hooked up and plugged in, it was nearly 10pm. Definitely way past his bedtime. Quentin sent me this photo first. However today one of the doctors called me and left a message saying that “because Stellan stops breathing when he sleeps, we need to order a second study with an oxygen mask.” I’m sorry, what?! So he really does stop breathing? Because we always wondered why he doesn’t just wake up casually in the night (or ever, really) but instead wakes up screaming bloody murder, with every muscle in his little body tensed up. So I guess it sort of makes sense. So now we wait. For another sleep study. Which requires insurance approval to schedule. And then another night in the hospital. And then, maybe then, this poor kid can get his tonsils out (I say that like it’s a fun thing) and might be able to breathe normally again. I hope. This morning I took Stellan for his first-ever dentist appointment. Since he “eats” the majority of his food via his g-tube, I didn’t feel I needed to be too concerned with taking him in right on his 2nd birthday, but I noticed what looked like a tiny bit of plaque in his upper molars when I was brushing his teeth a few weeks ago and thought it might be time. Stellan loves having his teeth brushed, so it’s easy for us to do it and fun for him, but I wasn’t sure how he’d do at the dentist, since he’s not the best at opening or closing his mouth on command. Frankly, when we want him to close it he tends to open it, and once he closes it, you just have to be glad there’s nothing important in there (like your finger) since you might not get it back. He has also been grinding his teeth more lately, which worries me and makes my skin crawl. So off to to the dentist we went, all the way on the Upper East Side. This particular dentist was recommended by our pediatrician because I wanted to go to someone who was comfortable with special needs cases, and any concerns I may have had were immediately alleviated when we walked in the door. The staff was lovely (and plentiful!) and the dentist himself was so kind and caring with Stellan, I could’ve cried with relief. And Stellan himself handled the whole thing like a champ, even if he did get mad when they had to put a little something in his mouth to keep it open while they did the cleaning. But the whole thing took less than 15 minutes. These people are pros. Stellan cruised out of there with not only a new toothbrush and all sorts of other fun dentistry things (and some for Zoe too! ), but also a balloon, stickers, toys… It was like dental Christmas. And he even got to check out PacMan for the first time, since they have arcade games in the waiting room. Best of all, his pearly whites are just that. No problems, nothing to worry about, so just another visit in six months. By then he should have some shiny new molars to show off. 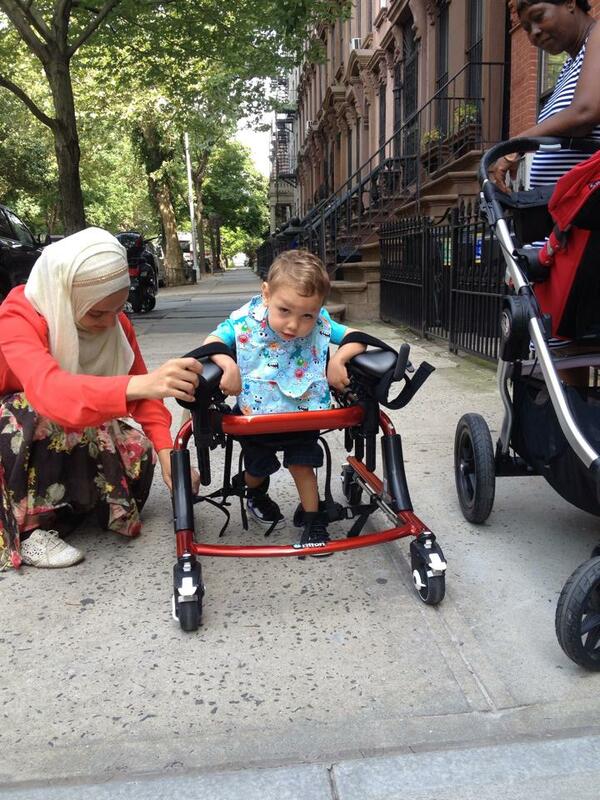 Today was such a beautiful day, we decided to take Stellan’s gait trainer out for a spin on the sidewalk instead of using it inside the apartment as we usually do. I’m sure we were quite a sight to behold, especially once I started dancing and marching in front of Stellan to encourage his steps, but I don’t mind if the neighbors or random passers-by think I’m a little off my rocker. Stellan walked – with lots of help of course – from in front of our building to the entrance of the building two doors down. Probably thirty feet! One very valuable thing I’ve learned through having a child who has to see a lot of medical specialists with long wait times for appointments? Ask to be called if anyone cancels. Because they do, and it means an appointment set for a month away can suddenly be an appointment the next day. Which is what happened to us today. The new doctor was really helpful and kind and not at all condescending as I explained my concerns and my theories about why Stellan’s breathing had suddenly taken a turn for the worst. He agreed that Botox injections in his trapezius (shoulder) muscles could definitely have had an adverse effect, and said that another laryngoscopy might be in order, but was able to to an in-office check first. This, of course, required placing a thin tube with a tiny camera on the end into Stellan’s nose and down his throat. I’ve never had this done to me personally, but I can only imagine how awful it must be (and also reminded me I’m glad we skipped the N-G feeding tube option), and Stellan definitely hated it. The good thing was that it was over quite fast – within 60 seconds – and would’ve been even faster, but Stellan has a tendency to hold his breath when he cries, so it took extra time for his airway to open up for a good picture. The other good thing is that the doctor recorded everything so we can compare with another video we’ll take in a few weeks time when we go in for a follow up. Because it turns out that Stellan’s tonsils and adenoids are both quite inflamed, particularly the tonsils. And that is definitely constricting his airway. Why does this make me happy? Because this is a “normal kid thing” and normal kid things are often things I forget about since we unfortunately have to deal with so many non-normal kid things with Stellan. We often assume the worst, when there could be a simple explanation like teething or tonsils. So we have been armed with medication to try to shrink both the tonsils and adenoids (a little spray into the nose on a nightly basis) and we’ll see the doctor again when we had our original visit scheduled in mid-August and hopefully see some progress. If not, it may be time for the little man to have his tonsils out. And in the meantime we also have some ways to help improve his breathing through better body positioning and simply reminding him to take deep breaths – something he kind of forgets to do when he’s concentrating hard on doing something else like using his hands. All in all, I’m tremendously relieved. At least for now! Today was a roller coaster. Stellan has been doing a strange, asthmatic-sounding breathing for the past several weeks. Not all the time, but when he does it, it is awful. The kind of breathing that, when you hear it, your own breathing gets all out of whack due to anxiety. We are switching Stellan over to a new pediatrician after starting Zoe at this practice, so I wanted him to be seen there and the breathing was a good excuse to bring him in. Since I’m still on baby brain, I had forgotten to make a payment to have his previous practice send over all of his records, so the doctor didn’t have all the background on Stellan. So I gave him a quick background and explained that this breathing thing seemed to have started about 4-6 weeks ago. I was worried it wouldn’t happen in the office, since that always seems to be the case, so I had a video on hand. But just sitting there in my lap, Stellan started his labored breathing and the doctor could hear it immediately. Since it is a quite recent thing (though Stellan’s breathing has always been a bit rough and gurgly) his concern was that a vocal cord may have collapsed. Apparently in “kids like these” there’s a risk of a vocal cord becoming spastic, which then leads to the cord collapsing. A horrifying possibility that had never even occurred to me. I’m not sure how I managed not to barf everywhere or burst into tears, or both. But I kept it together. Maybe because I purposely did not look at my adorable little boy in that moment. Just thinking about it as I right this makes my heart leap into my throat and my eyes brim with tears. Around that time I heard Zoe starting to cry in the waiting room, where she was with Molly. I realized I had her pacifier so I excused myself to give it to her. While I was out there, I remembered the Botox. Of course! I went back into the exam room, where Stellan was lying on the table in his diaper looking scrawny and yet totally adorable. 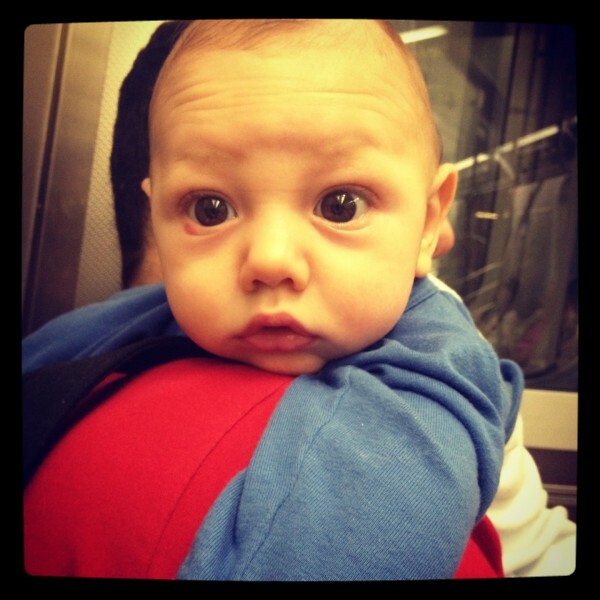 I mentioned the Botox injections to the doctor (again, not his fault – he didn’t have all of the background on Stellan yet) and said they’d been done in late April, with the results being strongest 4-5 weeks later, meaning about 6 weeks ago, or around when this breathing thing started. And to my extreme relief, he said, “that’s almost definitely what it is.” He’d had injections in his shoulders to relax them, as well as in his pectorals, and his head and neck control had gotten considerably worse as a result. He has gained strength since then, through a lot of hard work, but it seems that his breathing difficulties are directly related to the location of the injections. And the sound comes and goes depending on his position, which wouldn’t be the case if it were a collapsed vocal cord. Despite that good news (or lack of supremely bad news I guess), I have been a wreck for the rest of the day. The emotions are simmering just below the surface and I’ve had a hard time keeping it together. When Quentin got home, I explained what happened and sort of lost it for a few minutes. Which isn’t really a nice way to come home unfortunately. I think I put having a traech toward the top of the list of “things I never want to have to do to Stellan.” Everything seems to change with that type of procedure and all of the equipment that goes with it. Stellan would appear more “sick” and it would certainly be more complicated to care for him. So I really, REALLY hope we never go down that road. Of course, if we have to, we will find a way, and we will do the best we can for him and love him just as much as we do now, if not more. I think I do love that little man more every single day. No, I know I do. 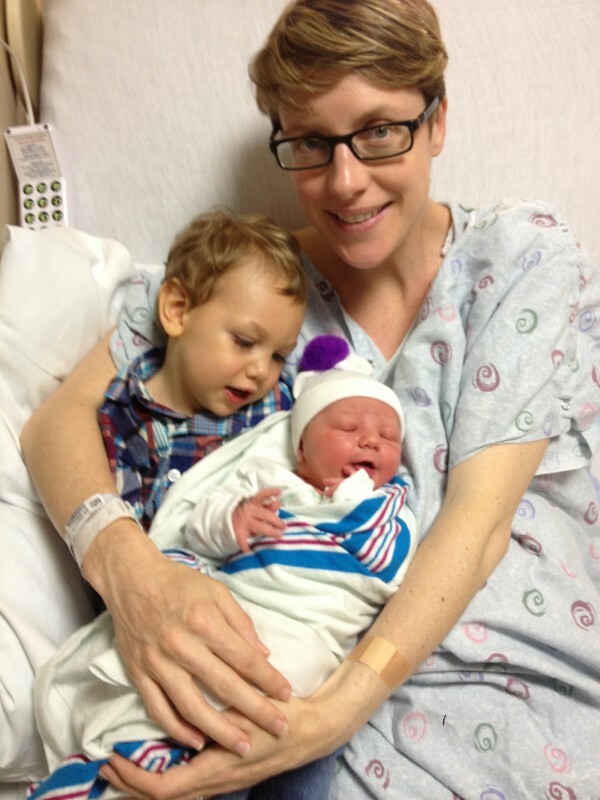 After a week of extra cooking, Stellan’s sister finally decided to arrive on Wednesday, May 28 at 8:17am. She’s 19 inches long and weighed in at 8 pounds, 2 ounces. 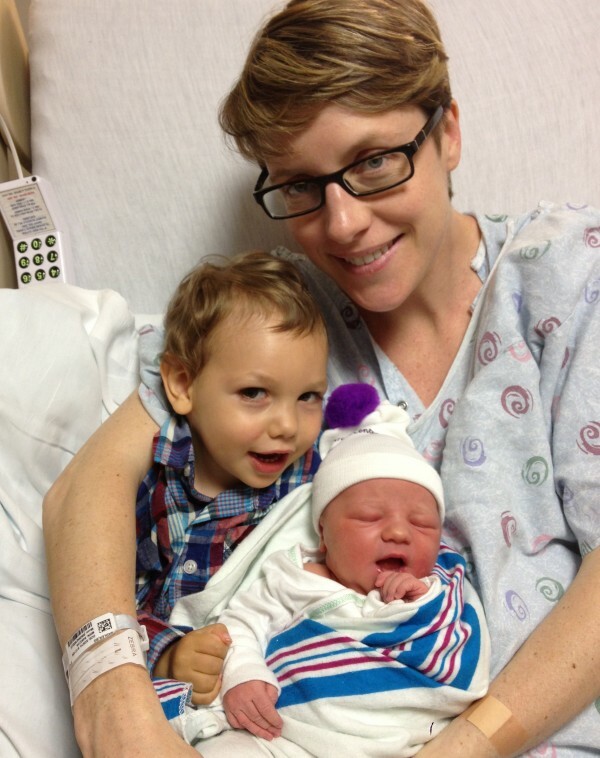 Labor and delivery were fast once again (five hours, like Stellan) which didn’t mean it wasn’t intense. But all is well, and everyone is healthy and recovering. 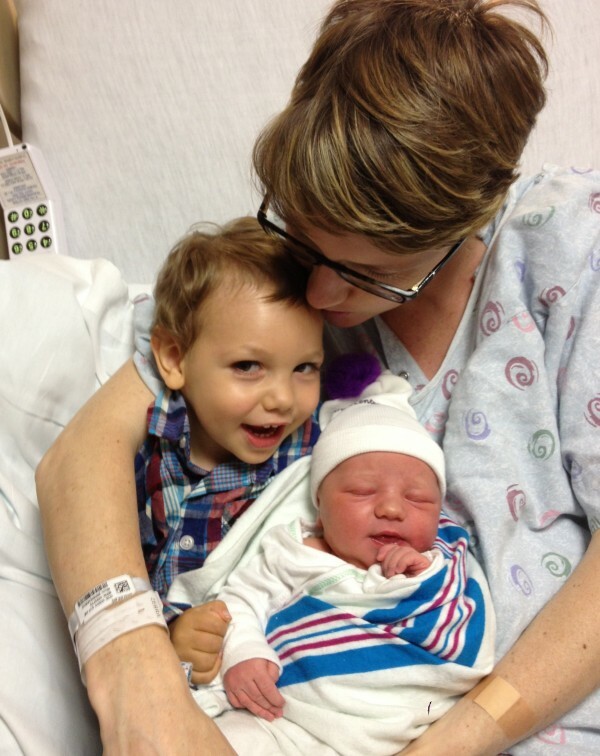 My parents brought Stellan to the hospital to meet his new sister, and he definitely seemed thrilled with her. Let’s hope it lasts! This weekend, Quentin, Stellan, Ellie and I went to the Hamptons – a first for all four of us. We packed ourselves into a van along with another French family with two kids, a boy and a girl, and headed to East Hampton on Friday night. We stayed at an adorable dog-friendly guesthouse run by a lovely woman with five dogs of her own, and spent the weekend doing beachy family things. We climbed sand dunes (which, by the way, is extra complicated when one person is on crutches, another one can’t walk and is finally getting heavy, and the dog wants to run as fast as possible in every direction at once), looked for sea shells, ate lobster rolls, played in the park, and went to a farm and got lost in a giant corn maze. Stellan loved being around the big kids, especially Solene, who is four and who loved to read to him and just be next to him. Stellan could really use a big sister. On Saturday afternoon, while wandering around the little town of East Hampton, we stopped at a playground. Playgrounds are kind of tough for me sometimes because I see all the little kids Stellan’s age running around, climbing things, falling down… none of which Stellan can do yet. So first we went on the big swings together, which he always likes. And then, on a whim, I decided to put him into one of the “baby” swings on his own. This usually doesn’t work because of Stellan’s lack of head control – he usually flops his head back. But yesterday he sat forward instead, grabbed the front of the swing, and went swinging like a boss. Stellan Swinging from Love, Stellan on Vimeo. When Stellan was about six weeks old, a small red dot appeared on his lower right eyelid. It slowly grew to a larger dot and as it became darker red and started to protrude a bit, Quentin in particular became alarmed. 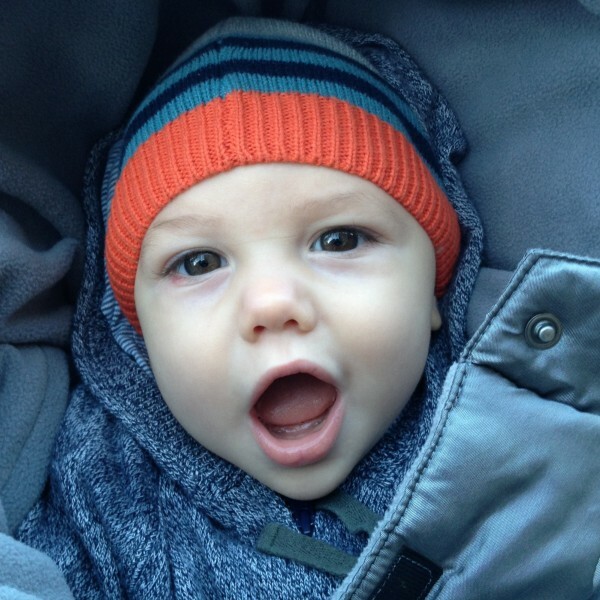 He insisted we take him to the doctor, which we did, and where we learned that it was likely a hemangioma and referred to a vascular specialist. The vascular specialist, a very lovely woman named Dr. Blei, reassured us that this hemangioma was benign but may continue to grow, which was only really a problem since it was so close to Stellan’s eye. She suggested trying a topical solution (Timolol), which we dabbed onto the spot twice a day. She also suggested we take Stellan to an opthamologist to make sure the hemangioma wasn’t causing any vision problems or an astigmatism. Which is how we ended up in Dr. Steele’s office. He took a look at Stellan’s eyes, further reassured us that we were doing the right thing in terms of treatment (the more invasive option was a laser), and told us that not only was there no sign of any astigmatism, but that Stellan’s vision was 20/20. Less than six months later, we were back to Dr. Blei and Dr. Steele for a follow up. By that time, the hemangioma had practically disappeared and we had begun to taper off the medication. 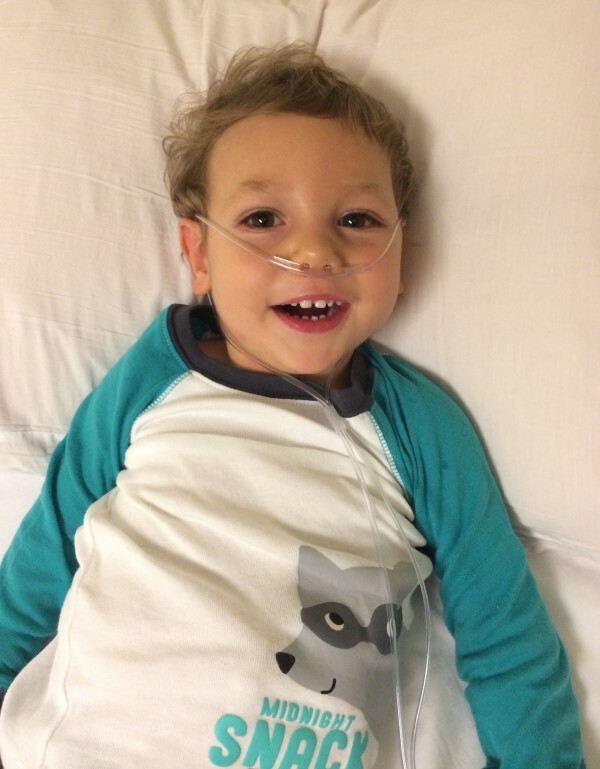 But we had much graver news, because Stellan’s MRI and diagnosis had come the month prior. When we think back now on our worry over Stellan’s little benign hemangioma, Quentin and I have to laugh sadly at ourselves. What was such a big deal and so scary was nothing compared to what was to come. Both doctors were very supportive. Dr. Blei directed us to a wonderful neurodevelopmental pediatrician (who, like all of them it seems, did not accept insurance) and Dr. Steele looked us straight in the eyes and said, “Don’t let anyone ever tell you what your kid won’t be able to do. He will surprise you and everyone else.” In other words, he made us cry, in a good way for a change. Fast forward a year and Stellan’s hemangioma has reappeared, which is unusual. So we visited Dr. Blei again last week and we are back on topical Timolol twice a day. We also saw Dr. Steele again, partly for a follow-up on the hemangioma, but mainly because our genetics doctor asked us to have his eyes checked again. Apparently certain syndromes have very specific issues with the eyes. So Monday morning we were back in Dr. Steele’s office, which Stellan loves because there are lots of fun things to look at. Of all the things, Stellan liked the computer the best (anything that might play Sesame Street for him is an immediate draw), and that’s fine with me as long as he’s sitting up and holding his head up. Dr. Steele checked out his eyes, did various little tests, took lots of notes, and finally said to me, “Your son is perfect, as far as his eyes are concerned.” Nothing is ever perfect with Stellan, clinically or medically speaking (his looks, however, are a different story), so I almost didn’t know how to process the information, aside from a warm feeling that overtook me, knowing that Stellan is lucky enough to have his dad’s perfect vision and not mine. So there. Stellan has perfect eyes.